NASA has announced that it would launch two missions to explore a little-understood area 96 km above Earth’s surface. The Global-scale Observations of the Limb and Disk (GOLD) mission will be launched aboard a commercial communications satellite in January 2018, and the designed spacecraft Ionospheric Connection Explorer (ICON) will be launched later this year, the US space agency said on Thursday. GOLD and ICON will team up to explore the ionosphere, a boundary area between Earth and the space where particles have been cooked into a sea of electrically-charged electrons and ions by the Sun’s radiation, reports Xinhua news agency. These layers of near-Earth space are increasingly becoming a part of human domain as it is home to radio signals used to guide airplanes, ships and Global Positioning System satellites. NASA said the two missions were complementary. ICON in low-Earth orbit, at 560 km above Earth, flies through and just above the ionosphere, like a close-up camera. GOLD runs in geostationary orbit over the Western Hemisphere, about 35,398 km above the planet’s surface. It will build up a full-disk view of the ionosphere and the upper atmosphere beneath it every half hour. The two missions can cooperate with each other when ICON passes through GOLD’s field of view and each mission can get a snapshot of the same region. This overlap in their data makes it easier to identify what caused a certain change to the upper atmosphere at a given time, NASA said. GOLD will also explore how the upper atmosphere reacts to geomagnetic storms, which are temporary disturbances of Earth’s magnetic field set off by solar activity. 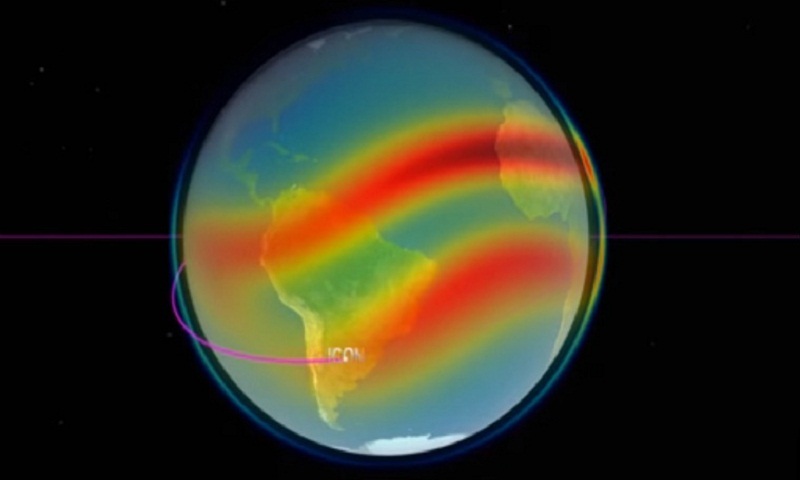 During night-time, GOLD will examine disruptions in the ionosphere, which are dense, unpredictable bubbles of charged gas that appear over the equator and tropics, sometimes interfering with radio communications.